Carlo D'Este's brilliant new biography examines Winston Churchill through the prism of his military service as both a soldier and a warlord: a descendant of Marlborough who, despite never having risen above the rank of lieutenant colonel, came eventually at age sixty-five to direct Britain's military campaigns as prime minister and defeated Hitler, Mussolini, and Hirohito for the democracies. 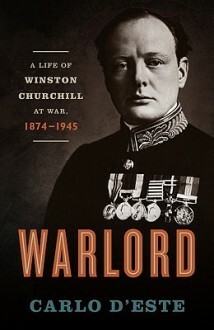 Warlord is the definitive chronicle of Churchill's crucial role as one of the world's most renowned military leaders, from his early adventures on the North-West Frontier of colonial India and the Boer War through his extraordinary service in both World Wars. Even though Churchill became one of the towering political leaders of the twentieth century, his childhood ambition was to be a soldier. Using extensive, untapped archival materials, D'Este reveals important and untold observations from Churchill's personal physician, as well as other colleagues and family members, in order to illuminate his character as never before. Warlord explores Churchill's strategies behind the major military campaigns of World War I and World War II—both his dazzling successes and disastrous failures—while also revealing his tumultuous relationships with his generals and other commanders, including Dwight D. Eisenhower. As riveting as the man it portrays, Warlord is a masterful, unsparing portrait of one of history's most fascinating and influential leaders during what was arguably the most crucial event in human history.